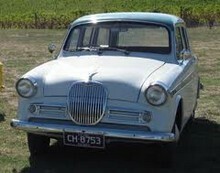 A new mid-sized Singer model appeared in 1956, the Gazelle. 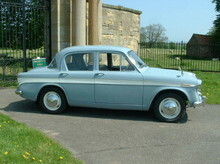 The Gazelle was basically a badge-engineered version of the popular Hillman Minx, in Singer guise the new car looked elegant and came well trimmed and equipped. A choice of saloon, convertible and estate bodies were available, often painted in bright, two-tone paint. Underneath the bonnet of the new Gazelle sat Singers own, well proven, 1497cc overhead cam engine. Unfortunately the ohc Singer engine proved to be less economical than the engine used in the Minx and over Rootes models. In 1957 the Gazelle II replaced the 1956 model and introduced an overdrive option, bigger fuel tanks and new trim. 8' 0" 4' 1" 0' 0" 13' 7" 5' 0" 0 (20) 0' 0"